Boots’ very own cosmetic brand No 7 is best known for producing affordable, good quality beauty products for women. Popular products such as the Stay Perfect mascara and the Perfect and Protect skincare range have been given a lot of publicity in recent years – but what about the extensive men’s range? The No 7 for men range has maintained a low profile ever since it was launched five years ago. But with products ranging from anti-shine lotion to a gradually building self tanning cream, we think this collection truly embodies the modern man and therefore deserves a closer look. According to Boots research, nine out of ten men think what they wear and the cosmetic products they use gives them more pulling power than the cars they drive. The message is clear: for No 7 men, looks are of the utmost importance. It’s fortunate then that all of the No 7 men’s products look sleek and stylish with minimalistic black bottles and cans giving off a desirable bachelor pad feel. According to Boots research, men’s skin is twice as oily as women’s, meaning they need to work extra hard to keep the shine away. No 7 Oil Control Face Wash is particularly useful for men who live in the city as dirt, pollution and the sticky underground can make oily skin a million times worse. To avoid build up, lather up a dollop of this face wash once or twice a day and rub gently into your skin for about 30 seconds before washing off with warm water. At just £7.50 per bottle, it’s a small price to pay for clean, matte-looking skin. This little bottle of roll-on gel is a saviour during long days at the office. Whenever you get that urge to put your head on the desk for a twenty minute nap, reach instead for your Rapid Revival Eye Roll-on from No 7. Give the tube a gentle squeeze and roll underneath your eyes in a sweeping motion. This will reduce those give-away eye bags and help you look alert and interested regardless of what the rest of the day brings. Buy your bottle for £12 for daily touch-ups. It’s not just women who desire a healthy glow throughout the year. 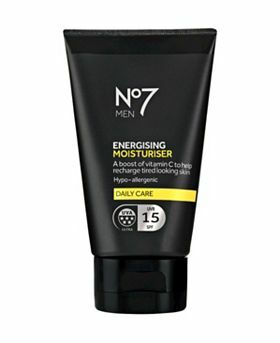 Men too can sport a light tan with this Energising Gradual Tan Moisturiser from No 7. This is for guys who want to achieve a subtle colour but don’t necessarily want to look like they have had a run in with the creosote. Vitamin C and UV protection ensures skin remains moisturised and protected as well as building a slow, natural looking tan. This is great for men with pale skin, or those who don’t have time to jet away to warmer climes this year. At £10, it’s on the cheap end of the self-tanning scale. Find out more about Men’s Grooming here.